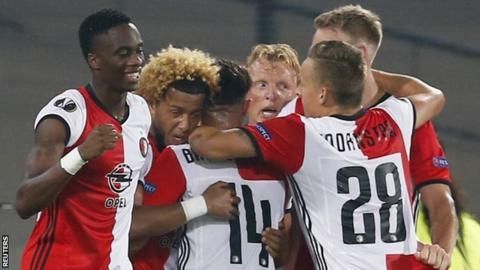 Manchester United suffered their second defeat in five days as Feyenoord ran out 1-0 winners in the Europa League. Jose Mourinho made eight changes to the team that were beaten 2-1 by Manchester City on Saturday, but he failed to get the desired response as Tonny Vilhena scored with 12 minutes remaining. United failed to test Feyenoord goalkeeper Brad Jones with any meaningful efforts, although Anthony Martial went close in the first-half with a sliced effort. The result means Manchester United have now lost four European away games on the spin for the first time in their history. Mourinho spoke in the build-up about how the Europa League may hamper his team’s Premier League ambitions this season, and he was true to his word by ringing the changes. Paul Pogba, David de Gea and Eric Bailly were the only United players to keep their place from Saturday’s Manchester derby defeat. Feyenoord, who are top of the Eredivisie after an unbeaten start to the league season, started with plenty of energy with Steven Berghuis testing De Gea from range on 12 minutes. Marcus Rashford was handed his first start under Mourinho and linked the play well on 25 minutes to release Matteo Darmain down the right flank. The Italian’s cross was met by Martial but he skewed a presentable chance wide from 15 yards. Feyenoord centre-half Eric Botteghin was denying Rashford with some meaty challenges and the England international struggled to have an impact on the game. Pogba cut a frustrated figure in midfield and showed his irritation with some snatched long shots just after half-time that Jones watched sail behind. Karim El Ahmadi swept an effort wide of De Gea’s post on 56 minutes as both teams huffed and puffed but lacked the required quality in the final third. Mourinho had seen enough by this point and made three changes, bringing on Zlatan Ibrahimovic, Ashley Young and Memphis Depay but it had little impact on the game, although Ibrahimovic flicked a Young set-piece wide from close range on 76 minutes. With the game seemingly petering out, the Dutch side countered with devastating effect to take the lead. Despite looking offside, Nicolai Jorgensen broke down the right and crossed for Vilhena to slide the ball home from 12 yards for his second goal of the season. Mourinho threw Chris Smalling up front to join Ibrahimovic in the closing stages, but it was desperate stuff, which the brilliant Botteghin and his defensive compatriots snuffed out with relative ease. It was Feyenoord’s first win against an English opponent since a 1-0 victory against Newcastle in the 2002/03 Champions League. Work to do for Mourinho in Manchester.